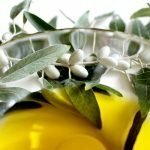 There are some affiliate links below, but they are all products I highly recommend. For more info, view my disclosure here. One important aspect of having dogs is keeping up their cognitive activity. These puzzles are a great way to keep them entertained while working their brain, which tires them out mentally and physically. They are all intended to be used under supervision, which helps build your bond. Read on to see the top interactive dog puzzles we love! The Shuffle Bone is a wonderful starter puzzle to get your dog used to interacting with and solving puzzles. It’s made of wood and is very sturdy. 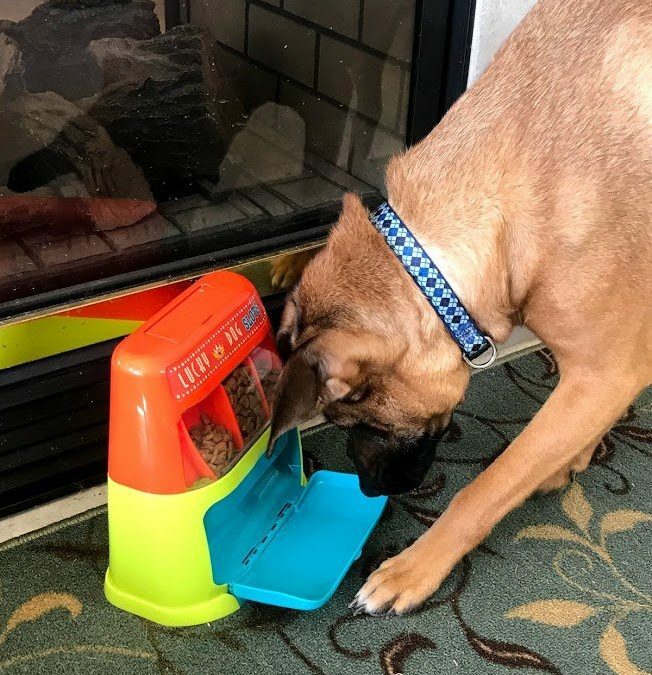 You simply put small bites of treats or kibble inside, and your dog pushes the slider to get to the treat. We’ve had the Shuffle Bone for over four years now and they still have fun playing with it! 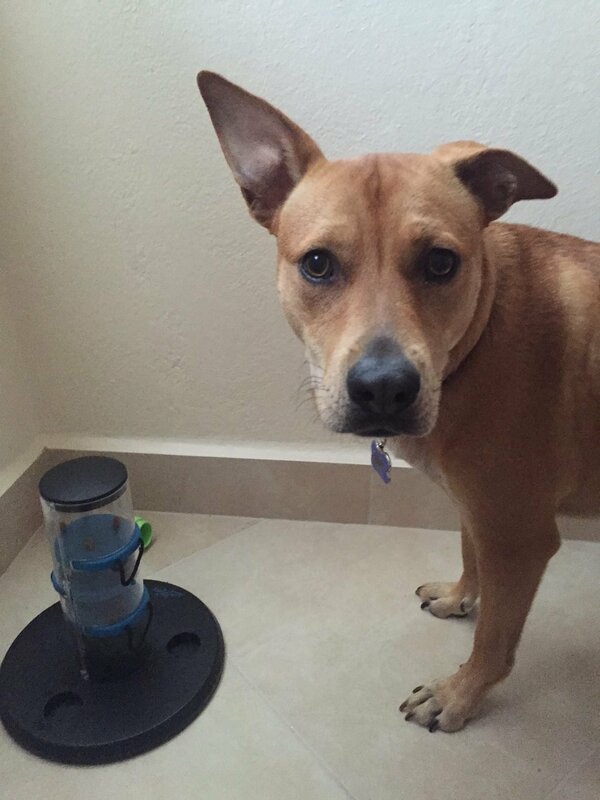 The Dog Smart Treat Dispenser is a Level One (entry level) treat and food dispenser. You can adjust the difficulty by switching the direction of the bones. 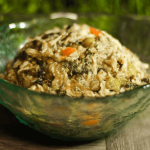 It holds up to one cup of food, so you could feed an entire dinner in it to stretch out meal time! The Trixie Gambling Tower has three shelves to place treats on, and your dog learns to gently pull on the attached loop to send the treat down and tumbling out. It also has cones to hide treats under that must be lifted straight up to access. This dog puzzle is a Level One, but for some reason Rico could NOT get the hang of lifting the green cones! He loves pulling the shelves out, though, which is still a great mental workout. The Bob-A-Lot is a perfect potential meal time feeder! You pour their food in, then set it on the ground. 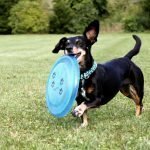 As your dog pushes it around, bits will fall out to keep them engaged. The Star Spinner is one of the cutest toys, and is a Level One puzzle that is simply adorable! It has ten chambers to fill with treats or food. By pawing and nuzzling at the Star Spinner, your dog learns to retrieve the hidden treats! 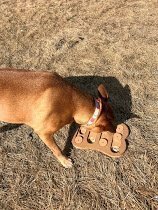 The Paw Flapper encourages your dog to use their nose to lift the flaps to solve this puzzle. It’s rated as a Level Three, however, Roxy was able to complete this one with only a little bit of help. She’s not a fan of using her brain, so it was a big achievement for her! The Dog Twister is a Level Three, for those genius puppers! You start by filling the compartments and they lift the lid to get to it. Once they get used to finding the treats inside, you can increase the difficulty by using the white locking handles that they must pull out before lifting the lid. The Lucky Dog Slot Machine is definitely Rico’s favorite! It holds small, dry food or treats. They have to press the lever at the bottom to get them to dispense, and the kibble drops onto the tray for them to enjoy! The Trixie Flip Board is a fun dog brain puzzle with lots of different techniques on the same board. The rubber rim on the bottom keeps it from sliding around. To begin, place your dog’s favorite treats in any or all of the compartments. By correctly sliding the covers or lifting the flaps and cones, the treats are revealed! The Trixie Mover Toy is a Level 3 puzzle that has four styles of play. It’s one of the more difficult dog puzzles, and definitely geared to more advanced puzzle solvers! It has cones and sliders to reveal hidden treats. For extra fun, there are drawers for your pup to open using the rope pull. All types of puzzle-solving strategies can be utilized in this board! Does your dog like doing puzzles? Do they have a favorite type? Share below! These all look like great options. We have an Australian Shepherd Rottweiler mix who loves puzzles and challenges. Puzzles are so fun and it’s cool watching them learn! Good luck! These all look awesome! Our pupper loves figuring out puzzles! My dog Myla is a 1 year old husky mix and has so much energy but is so smart! I would love to try these with her because we have tried a few basic puzzles before and it’s so much fun for both of us. We absolutely love puzzles in our family. Roxy definitely likes the simple ones or else she gives us the stink eye for making her work her brain. It’s so funny! Rico is allll about being challenged, luckily! That one is so cool! I love that Ryder is a puzzle fan too! I’d love to win this giveaway for Madden, as a family we keep madden physically active by hiking, swimming, jogging, unleashed adventured & exploring. We keep his mental stimulated by playing hide & seek with his humans & toys, a lot of nose work but he’s never tried this & I think he’d really love it! That’s wonderful you all keep so active! Love it! Good luck!! Hey! Eddy loves to stay active. I bet one of these puzzles would help keep his little brain active too! Yes, my dog does puzzles. Welcome to our pack! 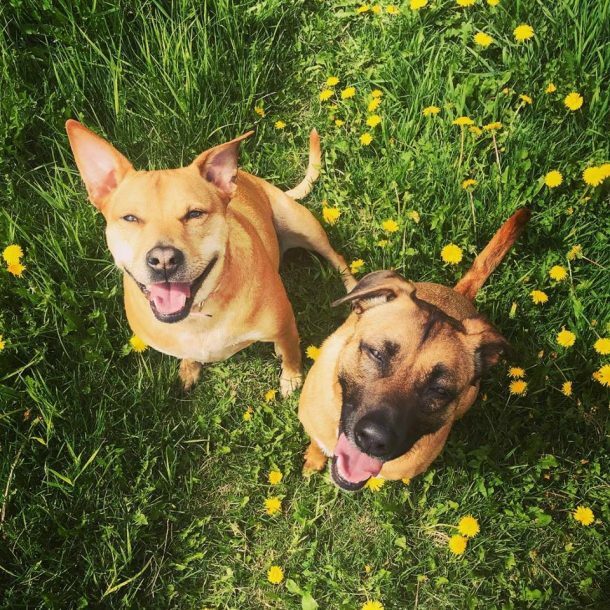 Sign up below and get our best tips to keep your dog happy and healthy!